Performance management is about establishing targets and measuring achievement against those targets as defined through project and portfolio planning. This is the “tracking” function of PD-Trak. It is critically important to select the right metrics for assessing project attractiveness. 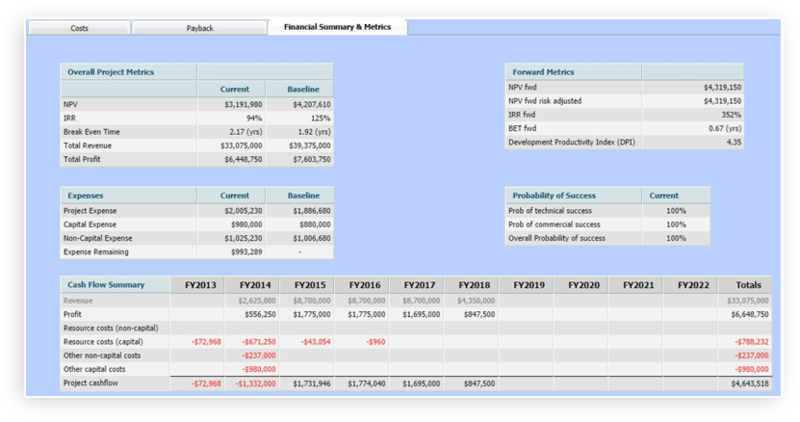 PD-Trak calculates an extensive set of metrics including Project Cost, Total Revenue, Total Profit, Gross Margin, NPV, IRR, Break Even Time, ratios such as NPV/Resource Cost (resource “bang-for-the-buck”) and many more. Custom metrics can also be supported. The metrics used by companies varies based on the type of project being conducted and Management preferences. The most commonly used metrics are NPV (magnitude of the financial opportunity) combined with IRR and/or Break Even Time (how quickly the investment is recovered). 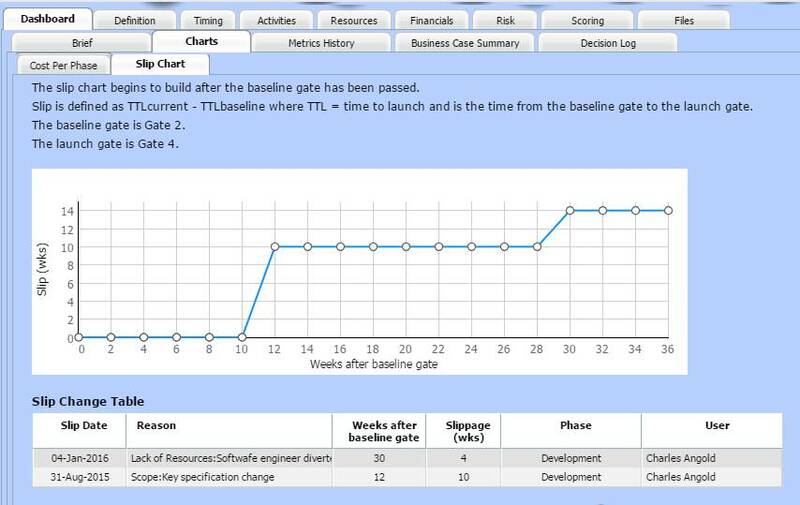 The metrics to be tracked are selected as part of the phase/stage-gate (process) template configuration in PD-Trak. As projects are conducted, the system captures the target values of these metrics at the Baseline Gate (as defined in the process template). As the project proceeds through development to launch and production ramp up, the current values of these metrics are compared to the baseline values to determine if the project is on-track. When the project is closed, a final assessment can be made – areas where achieved metrics fall short of targets are analyzed so that we learn from our mistakes and constantly improve the process. 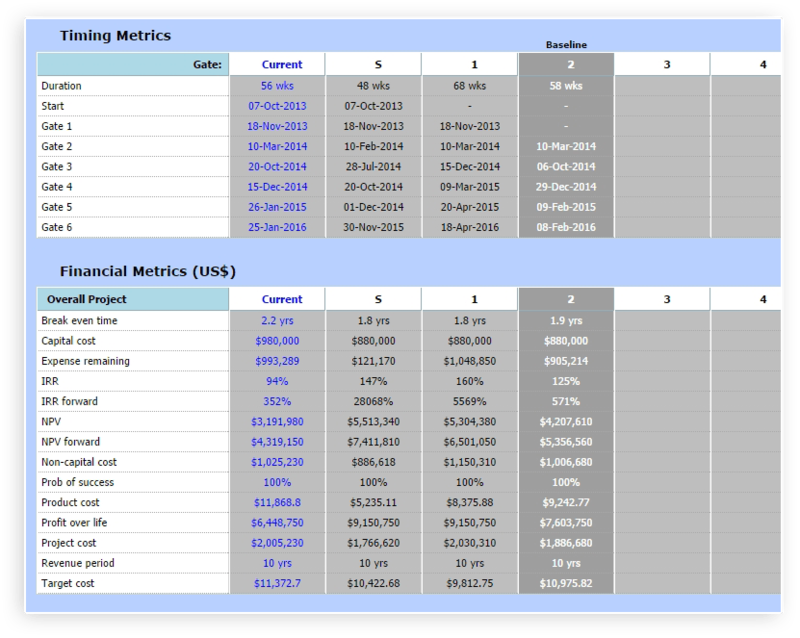 This page shows financial return metrics for the project and compares the current metrics with the baseline metrics. This page automatically records the values of key metrics as each phase/gate is completed. The top table tracks project timing. The second table tracks financial metrics which can be tailored to the metrics that are most important to your company. This report includes a chart displaying schedule slippage and a table that captures the reason for each slip event. One of the principal management reports is the Project List. This describes the status of each project and contains a set of project metrics. The metrics in this section are configurable from a larger list of metrics that the system supports. This report allows baseline target values to be compared to current metrics values to support Performance Management. 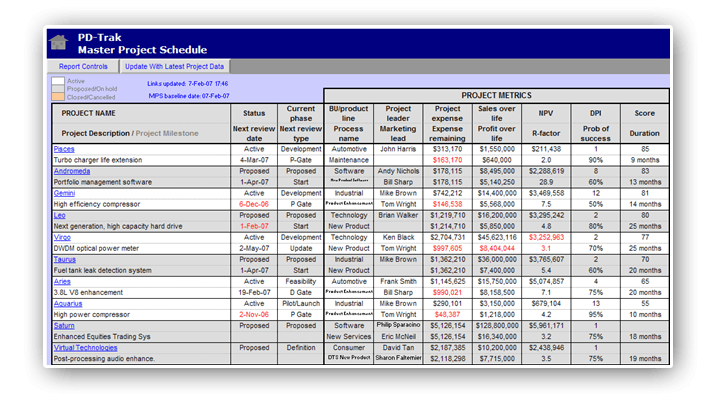 In the downloadable portfolio management tool, there is an equivalent project report called the Master Project Schedule (MPS). This also contains a section on the project metrics that is configurable. One of the performance management features in this report is the ability to establish an MPS baseline. Any changes to projects subsequent to resetting the baseline are shown in red text. When management conducts a program review, they can focus on those projects that have had changes to the project metrics shown in red. After the program review, the MPS baseline can be reset which changes the text to black. The gate dates section of the master project schedule shows schedule performance of the current plan compared to the baseline plan across all projects. 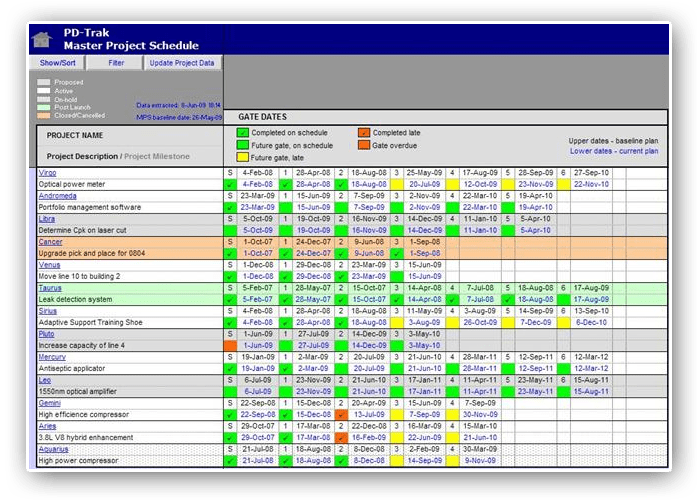 Color coding indicates whether projects are on schedule or behind schedule.